Apologies for the radio silence. It has been a whirlwind of activity in the last two months. I am currently on tour with the David Dominique Ensemble performing material from his new record “Mask” as well as some older tunes from “Ritual,” his previous record. Check out his music here: http://daviddominique.com/. Tour has been a blast so far with uplifting performances in Williamsburg, Richmond, and Charlottesville, Virginia. We will be journeying up North tomorrow to perform at Westchester University just outside of Philadelphia. After that we continue on to Manhattan, Baltimore, and Washington, DC. There is more information about all of the upcoming shows in the “Shows” section of this site. The David Dominique Ensemble at Little Dumbo, Richmond, VA. Photos by Phil McElhinney. Immediately following this tour, I am excited to travel to Seoul, South Korea for the first time to participate in an Arts Incubator program in collaboration with Ensemble Mise-En. 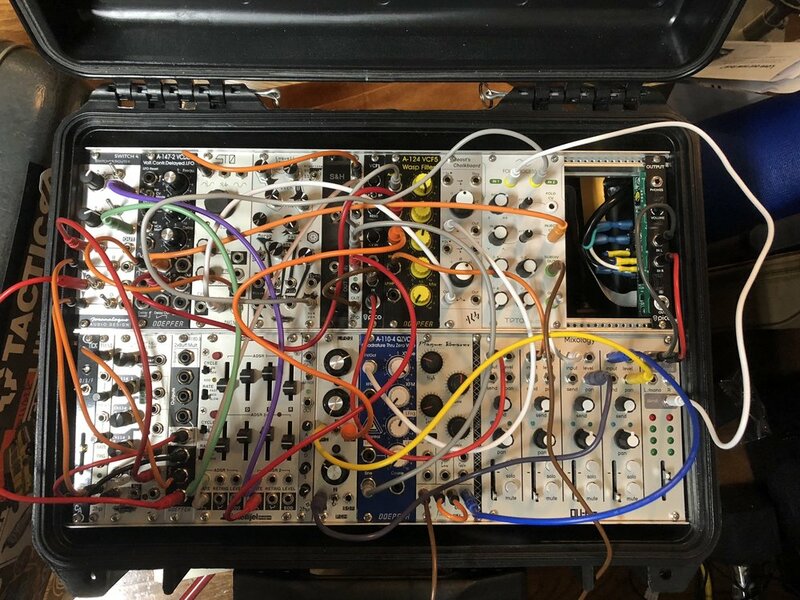 I will have the profound honor of having a new piece, “A Statistician’s Manual for Sound Earth,” premiered by Ensemble Mise-En as well as the joy of joining them onstage to perform it on modular synthesizer. I’m wholly psyched about this experience and very stoked to share this new work with such a powerful ensemble. Check out the photos below for a peek at the patch and the score of the piece! First, Marian McLaughlin released her beautiful record, Lake Accotink, which I had the honor of playing on. You can hear and purchase her music here: https://marianmclaughlin.bandcamp.com/ . Nagual & Stefan Christensen have also released a new 7” on the incredible label I Dischi del Barone. This release is a really cool document of some of the work we are doing and I am psyched to have a photo that I took as the cover. Grip a copy by sending me a message (copies will be up in the “Store” section in December if you want to wait) or at the label’s website: http://www.iddb.se. Nagual will also have a track on the new Redscroll Records Black Friday sampler so head over to their site or go to the shop to grab that. In addition to all of these, I recently self-released another short release on Bandcamp entitled “Is As It Was”. These are some fun rumblings from hours of recordings I have done with my current synthesizer setup. All proceeds go to Earth Justice. You can check out their work here: https://earthjustice.org/. The release itself is available at: https://igmnoise.bandcamp.com/album/is-as-it-was. Is As It Was by Ian McColm. Now available at www.igmnoise.bandcamp.com. Thanks for reading & I hope to see you at a gig!!! !